With 69km and 2000m of vertical gain standing between riders and a finisher’s medal at Val de Vie Estate, this year’s Grand Finale was arguably the toughest in the Absa Cape Epic’s 15-year history. With four beastly climbs punctuating the course, even the sharp end of the field would feel every metre. Despite their eight minute cushion over Cannondale Factory Racing’s Manuel Fumic and Henrique Avancini, Investec Songo Specialized would have to mark every attack and pray for a mechanical-free day following a string of bad luck earlier in the race. The Trek Selle San Marco 2 pairing of Fabian Rabensteiner and Michele Casagrande attacked and took the sprint on the Dimension Data Hotspot and opened up a 20 second gap in the process. Further back Cannondale Factory Racing were struggling to maintain a rhythm and risked losing their overall podium to the darkhorse Buff Scott MTB pair, who have been looking better and better as the race has progressed. A heated exchange between Jeremiah Bishop (Canyon Topeak 2) and Manuel Fumic (Cannondale Factory Racing) would culminate in a crash after Fumic appeared to deliberately knock Bishop off his bike. Fumic however, was quick to dismiss the incident as “racing dynamics” and expressed there was no “foul play” intended. The leading group would stay together for much of the stage before the Czech Express launched an attack on the Freedom Struggle climb in an attempt to splinter the group and gain an advantage heading into the final Land Rover Technical Terrain Section of the race – the “Bone Rattler”. Only Trek Selle San Marco 2 were able counter their attack, responding with a daring move of their own that would ultimately hand them a well-deserved stage win. Canyon Topeak had a bit of a scare on the final descent after Kristian Hynek suffered a rear puncture. With Cannondale Factory Racing breathing down their necks just a few minutes down, Hynek was quick to fix the leak as the two managed to hold on to second place on the general classification. 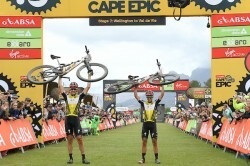 For Alban Lakata, it was a bitter-sweet moment as an Absa Cape Epic title continues to elude the Marathon World Champion. In the Absa African Men’s special jersey competition Matthys Beukes and Julian Jessop (PYGA Euro Steel) went into the final stage with a 12 minute buffer over the Ellsworth-ASG pairing of HB Kruger and Stuart Marais – a position they’d defend to the finish line. While the general classification remained unchanged it was the NAD MTB duo of Matthew Beers and Nico Bell who would take Grand Finale spoils after celebrating their first win of the race just 24 hours earlier on Stage 6. They were followed home by Ellsworth-ASG and PYGA Euro Steel.